picture. The notes have been added by Sven Grahn. In January 2012, when I perused an old photo-CD in the archives of SSC (previously the Swedish Space Corporation) I stumbled, by pure chance, upon two pictures of an unknown rocket type taking off from Esrange. The rocket in the pictures is very slender and left no trail of smoke. It took me very few seconds to realize that this must be a liquid propellant rocket (usually no smoke trail) and the only liquid-propellant rocket ever launched from Esrange was the last OTRAG rocket which is designated OTR-1 and the vehicle type was OTRAG 1-3-B (other designation OTRAG DLR K-OL-120). It was launched from Esrange on 19 September 1983 at 0559 UT. It reached an altitude of 4.2 km. OTRAG had launched its last rocket from Libya in December 1982 where it started launching in 1981 after the three launches out of the Kongo. Early in this period [1982-1992, SG], a fascinating project briefly touched Esrange. A private German project to build an inexpensive satellite launcher was announced - OTRAG. The rocket was going to be assembled from a large number of modular boosters. Testing would start with the launch of a single rocket, burning red fuming nitric acid and diesel oil. Gradually more powerful combinations would be assembled and tested. The flamboyant director of the project visited Esrange in his search for a suitable launch site. He came in his LearJet and was dressed in an impressive wolf fur coat. At the Ferrum hotel he asked to buy the piano! Another small detail that impressed us was that ordinary car windscreen wiper motors were going to be used in the rocket design. What could be more reliable in relation to cost? Unfortunately, in the end, the launch site was established in Zaïre, where an enormous land area was made available. Only one or two launches to low altitude of the basic rocket module took place. There was a lingering suspicion that the whole project might have been a cover to acquire some very valuable real estate in Zaïre... Then the launching activities were suddenly moved to Khadaffi’s Libya. 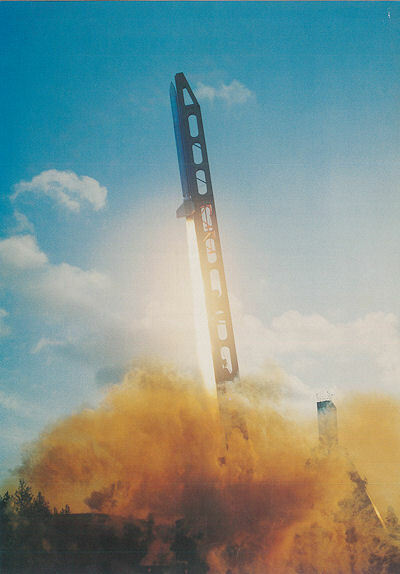 A number of launches were performed from there, until an article in the German magazine Stern revealed the operation. Of course, there was concern that Khadaffi might get hold of a rocket for military purposes. But OTRAG also survived this affair. In 1983 the next launch took place - this time from Esrange. The rocket flew normally for about ten seconds, when it suddenly exploded. The commission of inquiry found out that the reason was a payload problem. An opening had been made in the nose cone in front of the lens of a photometer [I heard it was a TV camera - SG]. There was no glass cover. When the rocket accelerated, the rectangular hole acted just like an organ pipe. This led to vibrations which caused the explosion. The failure became the final straw for the investors, and the OTRAG company was dissolved. - So far, OTRAG is the one and only liquid rocket we have launched from Esrange! ... "
"Arrived at Esrange at 0830 ... got the OTRAG story. The engine quit after 12 seconds (expected time 18 seconds), but the rocket broke apart in a radial joint. The theory: big hole for TV camera worked like an organ pipe! The experiments (mass spectrometer and TV camera) only flown for tax reasons (tax exemption for science). OTRAG may come back with the TEXUS campaign next spring." 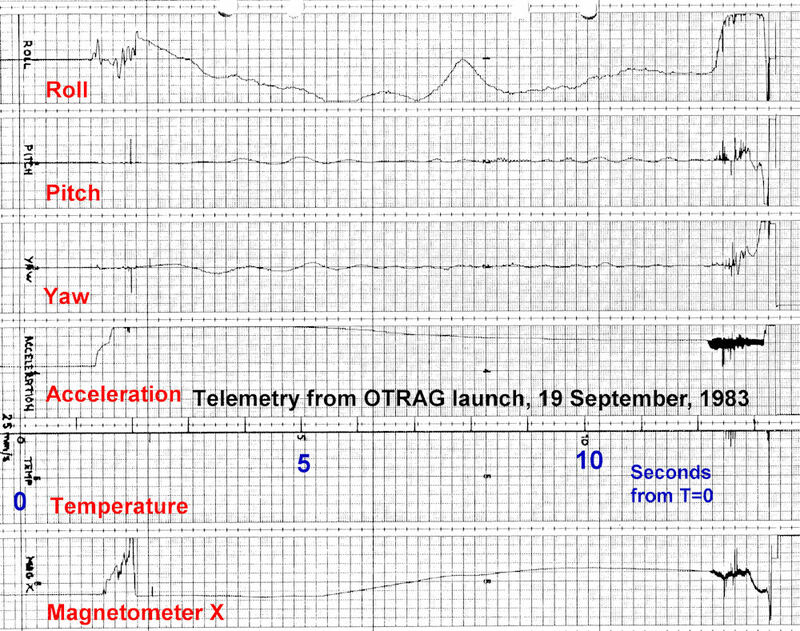 [TEXUS 9 was launched on 3 May 1984, but OTRAG was not there]. Let me just point out that these two stories about OTRAG are merely the result of hearsay - I have no idea how accurate they are! In the picture one can see a yellowish cloud which is probably a sign of the oxidizer. The green "rod" directly below the rocket is actually the MAN rail rocket launcher. There is a "tent" attached to the service tower of the blue-gray gantry tower originally built for the Aries rocket and nowadays extended in height and used for the MAXUS rocket. The tent was used for preparing the rocket for launch. However, there were experiments on OTR-1. In (2) the Technical University of Aachen and the Technical College in Munich are mentioned as "scientific groups". OTRAG planned to launch two 1-3-B vehicles to about 12 km apogee and one 1-6-B vehicle to about 34 km apogee. The plan was to launch the 1-3-B rocket to 11.9 km altitude after a propulsion phase lasting 15.1 seconds and with burnout at 4.48 km. The payload would have separated at 7.95 km 25 seconds after launch. The payload was planned to come down in a parachute. The booster would have impacted, in the nominal case, 8.2 km due north of the launch site. The propellants were diesel oil and white fuming HNO3. The tanks were filled to the 50 % level. Telemetry was transmitted at 104 kbit/sec on 230.33 MHz at 5 Watts. Transmitter made by INTUS. The television transmitter used 434.25 MHz at 5 Watts and the recovery beacon transmitted on 244.05 MHz at 0.5 Watts. The diagnostic payload contained 3 rate gyros (Western Electric type 8171001), 3 accelerometers (Edcliffe Mod. 701) along the rocket axis for measuring acceleration and vibrations, a 2-axis magnetometer, a barometric altimeter (up to 45 km), a pressure transducer for the combustion chamber, and a pressure transducer for the tank pressure. A "slant range" tracking system was also carried. The rocket was launched in good weather with a ballistic wind of 0.8 m/s from 118.2o degrees. Outside temperature was +9o C. The launcher was set at 83.7o elevation and 355o azimuth. Twelve seconds after launch telemetry was lost and many small pieces of the rocket were seen falling from the sky. The radar station tracked the vehicle until +12 seconds and then probably locked on a falling fin (5). The debris cloud reached an altitude of about 4 km. Organ pipe acoustic vibrations of 80 Hz originate in lower payload section due to trapezoidally shaped opening for video camera. Vibrations in payload excite longitudinal-Eigenfrequency of 8O Hz in thrust chamber, chamber pressure begins to fluctuate (audible buzzing sound) inducing longitudinal vehicle oscillations with amplitutes of 10 g in payload section, 7 g at vehicle base. One fin separates,inducing roll rate of 48 deg/s. Asymmetrical fin forces introduce yaw motion of more than 50 deg/s, also pitch. Roll, pitch and yaw rates combine to generate excessive free-free bending moment on vehicle. Fracture (bending with some torsion) of intersection between lower experiment and telemetry bay; rupture of oxidizer tank. Fuel tank separates from engine section and final vehicle break-up. Professor Thomae based his conclusions on the recovered debris, video recordings and telemetry such as in the graph below. Unfortunately, there are no indications of scaling of the graphs. "... Acoustic phenomenon cause for vehicle in lower payload was immediate cause for vehicle failure. Future payload should be tested for potential oscillation-inducing properties. Engine sensitivity w.r.t to chamber pressure vibrations should be tested, engine design should be modified to eliminate high feed-back sensitivity...". Rather extensive work needed to fix the problem, it seems. The picture on the left below shows the TV camera port - said to be the culprit in the failure. On the right is the valve actuating unit - a key part in OTRAG, and a fin. 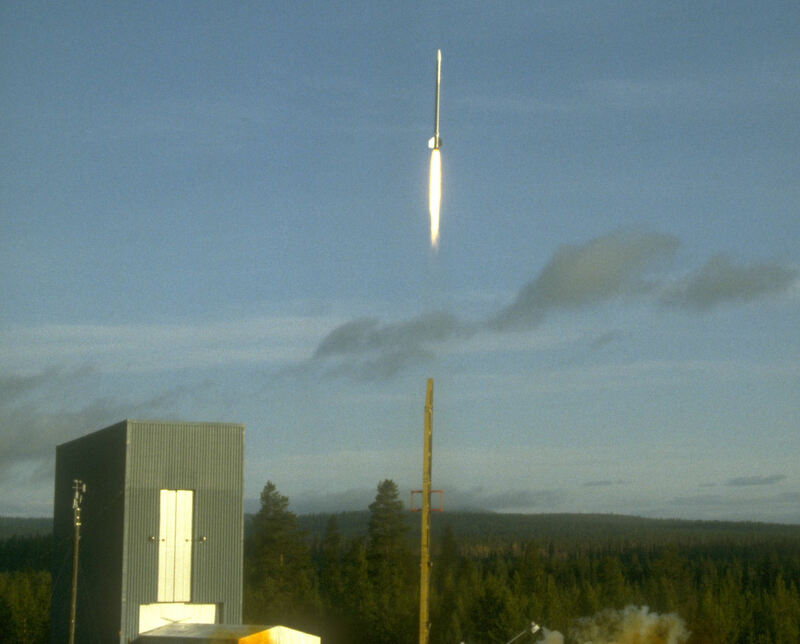 In early November 2013 I received another picture (see below) of the launch from Esrange from a member of the DLR team that launched the OTRAG from Esrange in 1983. We can see clearly that the rocket had three fins and not four as in the sketch above. The nitric acid gases can be seen as well as the Skylark tower in the background. A press release (opens in new window) about the 1983 launch was also published. It mentions nothing about the actual fate of the test. It just states that the rocket was launched successfully. If you by "launched" mean that it took off from the ground the press release is not untruthful. But it certainly was not the whole story. It is not easy to accurately reconstruct the history of OTRAG test launches and the configuration of each test vehicle. There are three sources which contain plenty of details and they are in some harmony with each other as to the technical facts. (From these three sources I have tried to compile a very short summary of sites and launches here ). As one can see from the account of the first two flight tests the accuracy of information available on the internet about the first two flight tests is not so high. OTRAG article at Bernd Leitenberger's site (in German). OTRAG article at Norbert Brügges site. 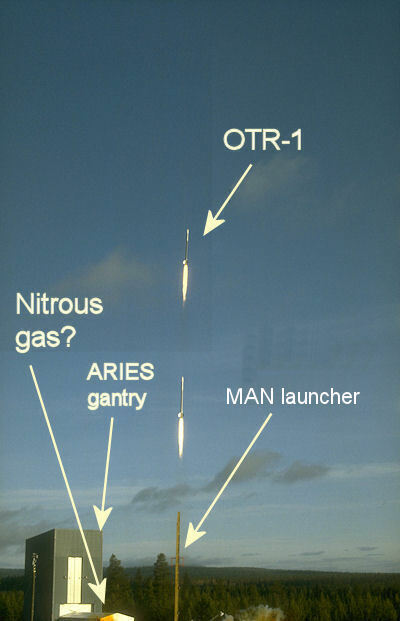 There are several pictures of OTRAG test vehicles which seem to resemble the vehicle launched from Esrange which is shown in a blow-up above left. It is hard to make out any details. In the Esrange archives I also found (7) a report about the very first flight test made in Zaire on 17 May 1977. 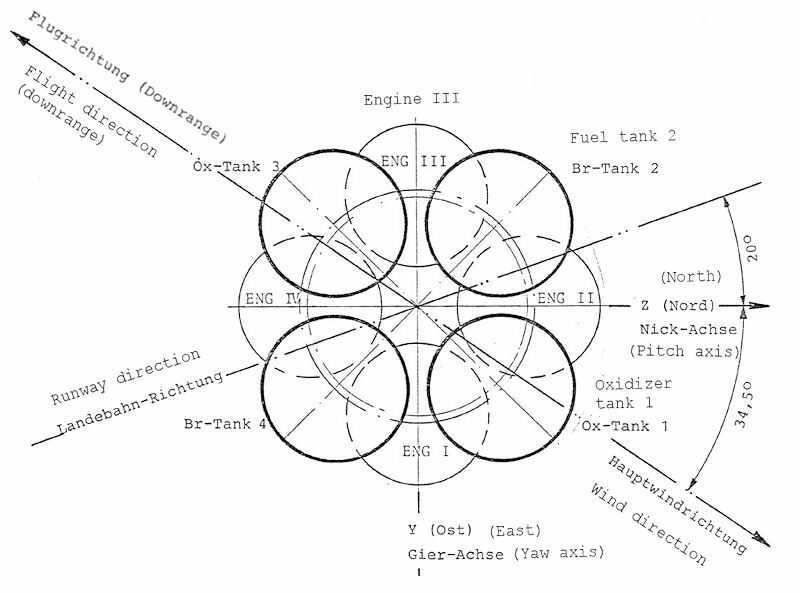 The vehicle carried four engines, two oxidizer tanks and two fuel tanks as shown in the figure below. I have added captions in English. The objective of the analysis in (7) was to use the available data on the flight to make a computer simulation of the flight. Pressure measurement transmissions through cable, evaluated by Mr Schönherr. Locam is a 16 mm high speed cine camera with up to 500 frames per second. I have not been able to determine what Bayer, Tobu and Neger refer to.The reference to measurements through a cable is a bit baffling. Did the rocket trail a cable connected to the launch pad? Yes, by studying the report from the next launch we can learn that the radio telemetry was introduced on the second launch and worked in parallel with a trailing cable (“Schleppkabel”). The pressure measurements via the cable were recorded on a Honeywell Visicorder. So, the first launch had very simplistic test data collection. Yaw 0.12° Yaw rate 1.6 °/sec. The vehicle lifted off 0.77 seconds after the time when the firing command was issued. Up until burnout the thrust differences caused disturbances much smaller than aerodynamic forces. Thrust misalignment did not cause roll movements, but the fins (This vehicle had conventional fins and not the tubular "fins" used later. 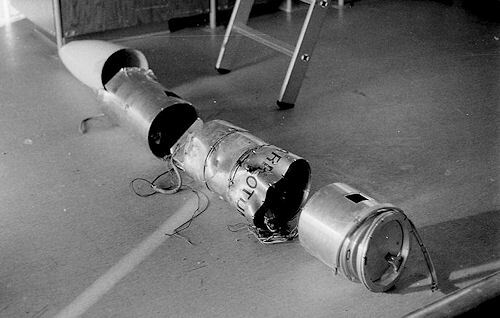 The picture on the right is probably this rocket) were set at an angle of 0.7°and 3 seconds after liftoff this had caused the vehicle to roll 67°. The simulation shows a roll rate of 682°/sec at burnout. Misalignment of engines relative to the tank was measured by theodolites to be better than 0.1°. The roll rate fell as the vehicle ascended because airspeed decreased. Burnout was observed when remaining nitric acid flowed through the hot combustion chamber and a bright flame and brown smoke appeared. 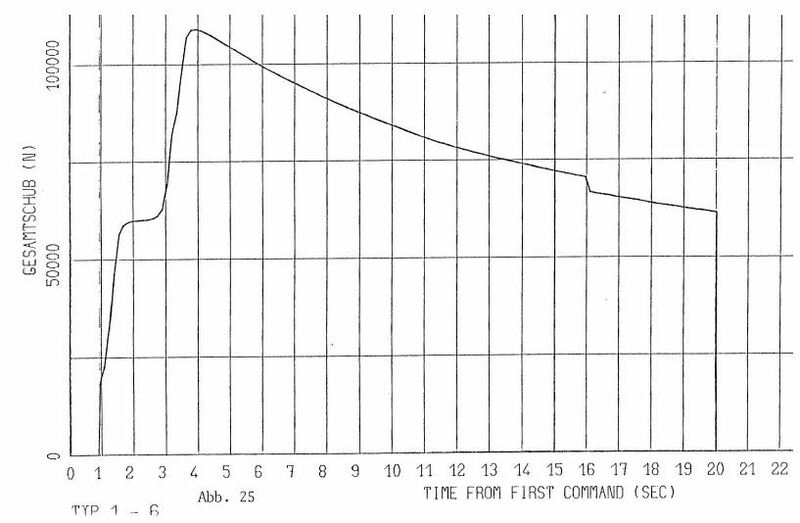 The second pair of engines suffered a 0.1 second difference in shutdown time causing a 4000 Nm torque, but the resulting pitch and yaw rates were quickly dampened by the fins. The “cold-gas” thrust of the flow of nitric acid continued long after burnout and could be seen as a contrail in the sky. The gas flow also reduced the “base drag” of the vehicle. The impact velocity was estimated through simulations to be 314 m/s. The vehicle penetrated 4.5 meters into the ground, so the retardation was at least 1100 g. The tape recording shows that the total flight time for T=0 was 103 seconds. The wind at launch was 3.9 m/s directed 145° to the North (the German expression is “zu Nord”). Before lift-off the chamber pressure showed variations at a frequency of 500 Hz. After liftoff there was a superimposed oscillation between 70 Hz and 500 Hz, the lower of which corresponds to the “free-free” structure resonance frequency at 30% propellant filling. The picture below can be found in (7) and shows the view of the plateau from which the launch occurred as seen from the impact point of the first vehicle. 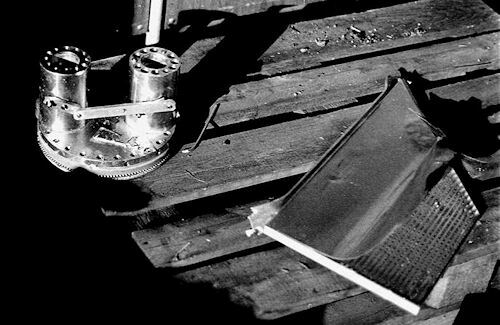 In (8), also found in the Esrange archives, the details of the second launch from Zaire are given. This report was written by Michael Schönherr. The rocket was fuelled to 60 %, but the four engines did not ignite simultaneously so the rocket flew a much "flatter" trajectory than planned. The intended flight time of 200 seconds was in effect cut in half. At any rate this flight saw the first use a a PCM radio telemetry system. Combustion chamber pressures and injection pressures were relayed during the first 4 seconds via the 200 m long trailing cable ("Schleppkabel") and recorded on a Visicorder as in the previous flight. Acceleration, attitude, altitude, temperatures etc were relayed by the PCM system and recorded on tape. 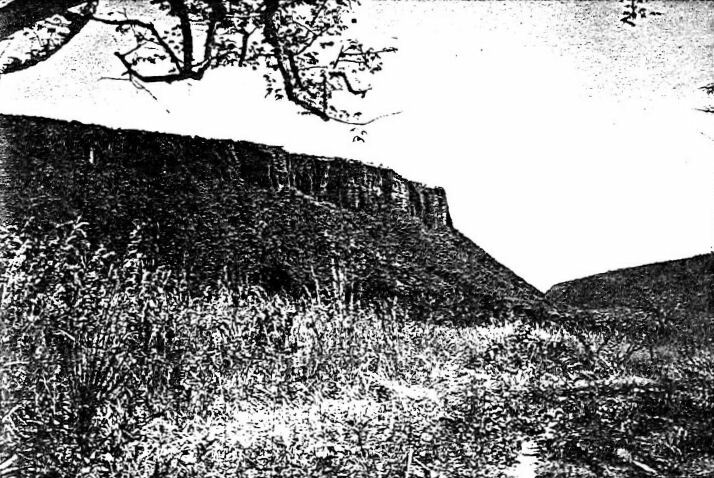 Ten film cameras (some high speed) recorded the flight and sound recordings were made. The audio also helped determine the distance to the point of burnout (6373 meters). Three of the engines (2, 3 and 1) ignited late. Fortunately, the second engine to ignite (Nr 2) was directly opposite the first engine to ignite (Nr 4). Otherwise, the report states, the vehicle would have toppled over. Anyway the late ignition and roll movement led to the vehicle flying over the control center. As can be seen in the graph from (8) below, it took almost 4 seconds for all engines to build up chamber pressure. Thereafter the typical blow-down behaviour of the propulsion system can be seen. The reasons for the delay in opening fuel valves is not discussed in the report but it is merely stated that the reasons were understood. Burnout occurred after 20 seconds. The onboard accelerometer seems to have suffered some shock damage at burnout, showing 1 g too high a value subsequently! The report discusses at length a sharp reduction in acceleration at T+16 seconds and attributes this to structural problems in the engine nozzles which worsened and led to loss of thrust at T+20 seconds (planned duration was 24 seconds). The distance to the impact point was estimated to be 16-18 km. Apogee was at about 9 km altitude. 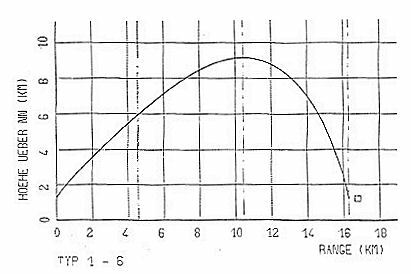 The graph below from (8) shows the post-flight evaluation of the trajectory. "Hoehe ueber NN" means altitude over "Normalnull", which is often used to mean "sea level". That is why the trajectory does not start at zero altitude. Otherwise, in (3) there is an intriguing piece of information. The author has been able to get hold of the text of the agreement between OTRAG and Zaire which includes a list of OTRAG's management team. Listed there is Reiner Klett - as "programmer", whatever that means. Reiner Klett is a well-known figure among the older generation of European space workers. During the 60's he was the head of the German Space Agency's Mobile Rocket Base (MORABA=Mobile RAketenBAsis). 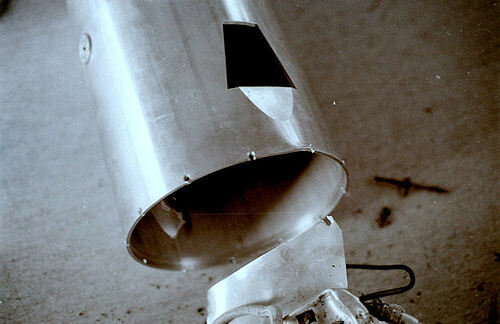 Later Klett joined with Axel Schmalz to run the space contractor Kayser-Threde. (I have met both gentlemen). Reiner passed away in 2006. I remember him as a very enthusiastic entrepreneur. Campaign activity at Esrange and Andoya Rocket Range in the period 1972-1984, ESA/PAC(84)6, Annex 1, page 10, Paris, 3 October 1984. Kampanjdokument för sondraketförsök DFVLR/CK 12 (OTRAG), 12 August 1983, Jan Englund. 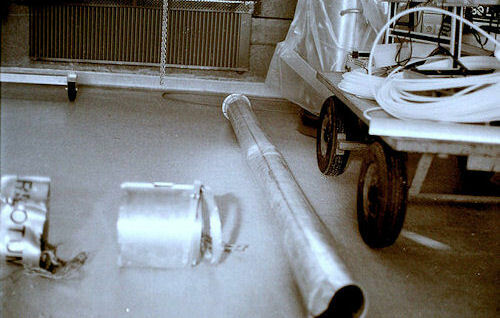 Esrange report concerning the OTRAG 1-3-P rocket failure September 19, 1983. Jan Englund 20 September 1983. Post Flight Report. OTRAG 1-3-P. Professor H.E. Thomae, Technical University of Aachen. Das ungeregelte OTRAG-4-Pack, OTRAG, 29 August 1977.